Enjoy these text variations of coding bookmarks. Teach students how to engage with the text by having a conversation with the author. Then, have students show evidence of how they are responding to the text. 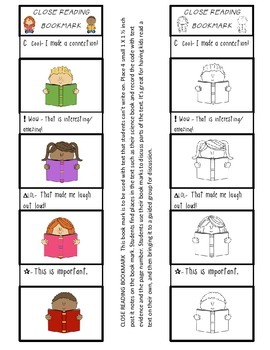 Choose the bookmark that best fits what you want your students to focus on when engaging with the text! 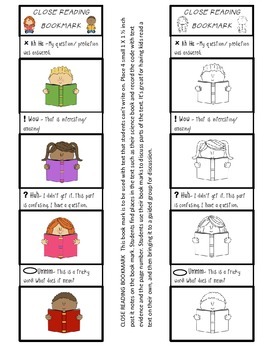 Students can either use post its on the bookmark, or use the bookmarks to remind them of codes/annotations to put directly on the text itself. This management tool is great for kids to use to monitor their independent reading and discuss with the teacher during an independent reading conference. This book mark is to be used with text that students can’t write on. Place 4 small 1 X 1 ½ inch post it notes on the book mark. Students find places in the text such as their science/social studies text and other nonfiction text to record the code with text evidence and the page number. Students use their book marks to discuss parts of the text. It’s great for having kids to reread a text on their own, and then bringing it to a guided group or open class for discussion. Included is a Post- It Response Card that can be printed front to back and laminated. 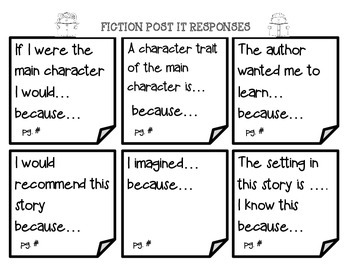 As students are reading they can complete any or all of the responses on the card.